Reasoning about floods and climate change | Climate Etc. I just came across a paper that I view to be remarkably important, entitled “Influence diagrams for representing uncertainty in climate-related propositions,” by Hall, Twyman and Kay. This paper integrates a number of themes that we have been discussing here: reasoning about uncertainty, consilience of evidence, attribution of extreme events, floods, and even the Italian flag(!). And it does the best job I’ve seen of assessing uncertainty and confidence in a climate-related proposition. Abstract. In order to respond to policy questions about the potential impacts of climate change it is usually necessary to assemble large quantities of evidence from a variety of sources. Influence diagrams provide a formal mechanism for structuring this evidence and representing its relationship with the climate-related question of interest. When populated with probabilistic measures of belief an influence diagram provides a graphical representation of uncertainty, which can help to synthesize complex and contentious arguments into a relatively simple, yet evidence-based, graphical output. Following unusually damaging floods in October–November 2000 the UK government commissioned research with a view to establishing the extent to which the floods were a manifestation of hydrological climate change. By way of example application, influence diagrams have been used to represent the evidential reasoning and uncertainties in responding to this question. Three alterna- tive approaches to the mathematization of uncertainty in influence diagrams are demonstrated and compared. In situations of information scarcity and imprecise expert judgements, methods based on interval probabilities have proved to be attractive. Interval probabilities can, it is argued, represent ambiguity and ignorance in a more satisfactory manner than the conventional Bayesian alterna- tive. The analysis provides a quantified commentary on the uncertainties in the conclusion that the events of October–November 2000 were extreme, but cannot in themselves be attributed to climate change. I’ve posted the paper on the web [hall twyman kay influence diagrams]. The specific problem that is addressed in the paper was a study commissioned by the UK Government that sought to establish the extent to which very severe floods in the UK in October–November 2000 were attributable to climate change. An overview of influence diagrams is provided by the Wikipedia. A Bayesian Network is a type of influence diagram. Influence diagrams are hierarchical and can be used as the basis for a logical hypothesis hierarchy. for Interval Probability Theory only, pair-wise dependency estimates at each node in the diagram. The results are displayed in Table III using point probabilities for the Bayesian analysis and Italian flag interval probabilities for the SLP and IPT analyses, whereby the number on the left is belief for, and the number on the right is belief against the proposition. The source proposition receives a support of 0.58 from the Bayesian belief network, [0.21, 0.86] from SLP and [0.37, 0.72] from IPT. The probability measures for proposition B1 indicate that the 2000 flooding and rainfall were highly unusual in the historical context. The existence of hydrological climate change is much less certain, with nearly as much evidence against Proposition B2 as for it. Support for the proposition that ‘Upward trends are present in historical flooding and rainfall data’ (shorthand: ‘statistical trends’) is 0.49 from the Bayesian belief network, [0.10, 0.68] from SLP and [0.23, 0.65] from IPT. The three results demonstrate more belief against the proposition than in favour of it, and SLP and IPT indicate major uncertainty. Punchline: the Bayesian belief network analysis supports the hypothesis, whereas the interval probability analyses do not support the hypothesis and indicate major uncertainty. The use of influence diagrams for evidential reasoning applied to a prob- lematic climate-related proposition has been demonstrated. The influence dia- grams have provided a structured commentary on the conclusion that the events of October–November 2000 were extreme, but cannot in themselves be at- tributed to climate change. Three alternative inference mechanisms have been tested on the same influence diagram structure. Support Logic Programming and Interval Probability Theory both deal with interval bounds on an unknown probability measure and are attractive in being able to represent in a straightfor- ward way legitimate imprecision in our ability to estimate probabilities. This is particularly useful in situations where evidence is scarce or ambiguous. Inter- val Probability Theory has the added attraction of being able to represent de- pendency relationships between evidence that are not implied by the network structure. Influence diagrams can help to synthesize complex and contentious argu- ments into a relatively simple, yet evidence-based, graphical output. The graphical structure can formalise expert reasoning, facilitating dialogue between experts, policy makers and other decision stakeholders. In the case of the October–November 2000 floods in the UK, influence diagrams have demonstrated sources of uncertainty and conflict in the available evidence. The analysis has demonstrated how the reluctance of scientists to commit themselves to conclusions about the floods was due to insufficient evidence in the pivotal arguments that related available data via expert reasoning to the hypothesis that the events were a manifestation of climate change. Thus the process of constructing, populating and testing an influence diagram has generated valuable insights. JC comments: This is how it should be done. This paper has made obselete my draft Waving the Italian Flag: Part II. This paper is featuring prominently in my draft paper “Reasoning about Uncertainty” that will be submitted to the special issue of Climatic Change on framing and communicating uncertainty for the IPCC (a draft of which will hopefully be posted by the end of the week. Perusal of the citations of the Hall et al. paper on Google Scholar shows only 6 citations; hopefully this post will bring further attention to this important paper. Note to James Annan: this is why I am not impressed with your Bayesian analyses of sensitivity. Note to Fred Moolten: this illustrates how complex the consilience of evidence argument is, and simple methods for reasoning about multiple lines of evidence can be very misleading. Moderation note: this is a technical thread that will be moderated for relevance. This entry was posted in Attribution, Uncertainty. Bookmark the permalink. It’s interesting to see this paper as it basically does exactly what I suggested be done with this methodology (though I hadn’t considered using multiple methods of combining evidence). It’s nice to see actual analysis of evidence strength rather than vague statements based upon impressions. I have questions about a number of details in the work, but because of the clarity of this approach, they are easy to detail and discuss. That’s how things ought to be. Hopefully this sort of thing catches on. The results are displayed in Table III using point probabilities for the Bayesian analysis and Italian flag interval probabilities for the SLP and IPT analyses, whereby the number on the left is belief for, and the number on the left is belief against the proposition. Obviously the number on the left can’t be both belief for and belief against the proposition. The second “left” should say “right.” I think there’s also a typo in the paper “multiply” instead of “multiple,” but that doesn’t really matter. Judy – Thanks for this reference. I look forward to reading it in detail. As you know, you and I seem to agree on many things, but we disagree on how much uncertainty characterizes many climate science conclusions. I enjoy focusing on this, not only because it’s important, but also because disagreements discussed in a rational and informed manner are likely to be edifying – at least for me. I’ll comment further after I read the materiaal. An AHP model could contain three choices (support for/uncertainty/support against) for a three-value logic problem with however many relevant factors added as attributes. Two principal strengths of AHP are to be able to quantify the internal logic of the decision maker’s judgments and calculate the compatibility of judgments across multiple decision makers. Another strength I think is that AHP is not linear like a decision tree or influence diagram. Instead, you just throw in all the factors and then assign influence between them. A factor can be a sink, source or two-way node. There is free software available at http://www.superdecisions.com/ but this program does not support multiple decision makers. If you have considered AHP and decided against it, I’m very interested to know the reasons. And any thoughts denizens here have on AHP for an IF problem. Wow. Excellent paper. What I am afraid many people do is mentally “vote” on a concept via either how good a story it is (“consistent with” their worldview for example) or pick out a few aspects of a theory or proposition and see that those agree with data/theory (depending on which way we are looking). One bone to pick is that when testing a theory per se, contradictions vs data should count much more against it that a bunch of agreements count for it. For example, if glaciers started receding in 1750 but your reconstruction of solar activity says the sun has been constant, something is wrong that impacts all the way through your GCMs. It is not just another data point like how well a GCM matches Chicago weather. The 3 point rating system is a natural for human beings. 2 thumbs up, 1 thumb up, no thumbs up. for us, against us, on the fence. This sort of scale minimizes human induced factors, delivering a more accurate result. Instead, split the problem into components to analyze the shades of grey. Recognition of the accumulation (multiplication) of uncertainty with each link in a chain is a good start. The more detailed the conclusion, the less likely it is to be valid. Judy – My assessment of this paper is that it formalizes what was in essence a disagreement in the subjective opinions of a group of experts. Some opined that hydrological climate change had occurred, and others did not, and as a consequence, they reached no clear conclusion as to whether the floods were due to climate change. The authors acknowledge the level of subjectivity involved due to the paucity of objective data, but the lack of data was to me the main message, and the different approaches were subordinate. All, in fact, were basically Bayesian, and the standard Bayesian point probabilities, the IPT, and the SLP analyses yielded fairly similar indecisive results. It has been said that, “you can’t manufacture knowledge out of ignorance”, and so assigning a number or a range of numbers won’t change that reality. In my view, the uncertainty level in the paper was more or less a quantitation of the extent of disagreement among experts rather than a unique entity in its own right. I was not particularly impressed by the use of interval probabilities as opposed to point probabilities, although I’m willing to be convinced. Probability is not an inherent property of a proposition or outcome, but a description of our state of knowledge (or ignorance) about the proposition. To discuss an interval of probabilities is to imply that we have many different states of knowledge about the same proposition. I suppose that’s reasonable for meta-analyses that compare one group’s probability estimate with another’s (particularly if they have different data at their disposal), or use multiple different probability estimates to construct a pdf for a Bayesian prior, but if the goal is simply to look at evidence and derive a probability estimate, a point probability would seem to make sense. Again, P = 0.3, for example, means nothing more than that our best estimate of the truth of a proposition is that we are 30 percent likely to be correct if we judge it true. The proposition itself is either true or false – it does not have a probability. I believe this extends even down to the quantum level, where the Schrodinger equation is deterministic, and probability emerges only when we try to determine a particular outcome for the macroscopic world in which we live. This perspective is also why I would usually feel more comfortable with confidence intervals or credible intervals than with probability intervals. Regarding my statement above – “P = 0.3, for example, means nothing more than that our best estimate of the truth of a proposition is that we are 30 percent likely to be correct if we judge it true” – there is a frequentist interpretation that doesn’t conflict, but looks at it from the perspective of multiple independent trials of propositions similar to the one at issue, estimating the frequency of positive trials to be 30 percent based on knowledge about these propositions. I have to take umbrage at the cat is 100% alive and 100% dead. Probabilistic is not deterministic in any world. You may be a many worlds fan – but it is just one possible interpretation. From the key results of the paper. Hydrological speak for we don’t know – fair enough. Scanarios(? ): higher air temps = more extreme rainfall? Unprecedented hydrological events are common with limited records. The lack of ‘clear statistical trends’ is globally typical. 4. Given the uncertainty surrounding Proposition B2, it is impossible to determine whether or not the October/November ﬂooding and rainfall was a manifestation of climate change. Well yes. Oh I forgot – we are reversing the presumption of proof these days. It means that this and the Japanese earthquake were the result of climate change. The statement that “the wavefunction is now accepted to be a probability distribution” is incorrect, if probability distribution is meant to imply that the solution to the Schrodinger equation is probabilistic. If it simply refers to the probability of finding a particle within a particular location, that is uncontroversial. I previously quoted Penrose on this point, and you can review his explanation of how the deterministic equation translates into a probability distribution for observation. There may be some who disagree with Penrose, but any statement that a different conclusion is “accepted” will be hard to justify. None of this is relevant to the cat paradox, because that involves either the “collapse of the wavefunction” or a “many worlds” interpretation, both of which are consistent with determinism at the quantum level combined with probabilistic outcomes when observations are made. I’m not sure why you feel the statement is incorrect, this is basic quantum physics taught in undergraduate level P-Chem. The wavefunction is based on “the Born interpretation”. The Born interpretation says the square of the wavefunction is proportional to the probability of finding a particle at each point of space..i.e. the probability density. The wavefunction is essentially describing what the orbitals of an atom look like. Each orbital has a different energy level, the further away from the nucleus, the higher the energy. This is what the wavefunction in the Schrodinger equation describes, the probability density of finding the electron within an orbital in an atom. If you solve the Schrodinger equation for various energy levels, you will find the lowest energy level, the s orbitals, is like a sphere. When you solve for the next levels the 2s orbital is a sphere with a ring and the 2p orbitals look like lobes with a node. There are three p orbitals, one along each coordinate axis, x, y, z, and so on to the higher level orbitals. Consulting any P-Chem text will describe this as this is the foundation to atomic structure. “As long as the system remains at the quantum level, the quantum state evolves in a completely deterministic way…. governed by the important Schrodinger equation”…”When the effects become magnified to the classical level…, the squares of the moduli of the complex amplitudes must be formed…and these real numbers now play a new role as actual probabilities”. I don’t think that necessarily conflicts with your statement about the probability density of finding the electron within an orbital in an atom, because the part I italicized refers to where we are making observations. It is our observing a particular state that is associated with a probability. But maybe it’s a disservice to Judith Curry for us to get diverted into extended discussion about a brief point I made that was peripheral to the topic of this thread. I agree, not the space for such a discussion. ‘The Copenhagen interpretation is the “standard” interpretation of quantum mechanics formulated by Niels Bohr and Werner Heisenberg while collaborating in Copenhagen around 1927. Bohr and Heisenberg extended the probabilistic interpretation of the wavefunction proposed originally by Max Born. The Copenhagen interpretation rejects questions like “where was the particle before I measured its position?” as meaningless. The measurement process randomly picks out exactly one of the many possibilities allowed for by the state’s wave function in a manner consistent with the well-defined probabilities that are assigned to each possible state. Since this discussion began, I’ve encountered statements toward both a deterministic and a probabilistic interpretation of the Schrodinger equation at the quantum level, with universal agreement that it translates into a probabilistic picture of the world we inhabit. I don’t know enough about the subject to judge these matters, but I regret that I started this distraction to the original theme of this thread. I think we should get back to that. If a make a light hearted comment – and simply quote an expert – I do not see the need to insist that Dr Ian Taylor is incorrect or that you have superior insight or any topic under discussion. Put simply we have probabilities evolving over time. ‘Mathematically, it is a function from a space that maps the possible states of the system into the complex numbers. The laws of quantum mechanics (the Schrödinger equation) describe how the wave function evolves over time.’ The latter is what Penrose defined as determinant – but is in fact evolving probabilities. You rudely reply to a light hearted comment, grossly misinterpret the math and then suggest an abrupt end to the discussion. Instead – why not reply to the other substantive and on comment remarks on the hydrology? Robert – This is a topic I’d like to understand better than on the basis of very general notions I now have. It may need to wait for another occasion, or maybe a few more comments here if they don’t distract. I have no quarrel with the experts, although they may quarrel among themselves. My question relates to the following. As I understand the concept, it’s generally agreed that finding a particle (electron, photon, etc.) in a region, X, is a matter of probability – we observe it either to be there or not. Where is it when we are not observing? Is it either in X or not in X with a certain probability? Or is it spread out so as to be in X and everywhere else at the same time, at different “densities” that are deterministically prescribed by the Schrodinger equation? (This is of course a non-mathematical characterization and can’t accurately capture the entire concept). As an example – if probability determines which slit we observe a photon to traverse, what can we say about the discovery that when we don’t observe it, a single photon traverses both slits? From a P-Chem view of this problem, I would suggest reading “Quantum Chemistry” by Ira Levine. I have the 3rd edition, I don’t know the latest. He discusses this very early in the book, page 10. It is far more complex than what we have room for in this thread, but involves an electrons wave/particle duality, the uncertainty priniciple and perturbation theory wrt to observation. This was a text we used for understanding quantum mechanics and it relation with spectroscopy. All the descriptions of quantum mechanism and the meaning of wave function in this thread are to an essential extent incomplete. They have clear relationships to, what QM means, but they are limited to almost trivial examples and do not offer the way towards understanding more complex quantum mechanical systems. The state in quantum mechanics is best described as a vector in Hilbert space. The standard description of the wave function as a complex function of space coordinates is one way of defining the state, but there are other equivalent ways and there is nothing fundamental in any of them. The state (or wave function) can be used to determine the probability of finding a particle at a particular point, when it is checked, whether it is there, but that is not the whole content of the wave function. It is true that the quantum state develops deterministically under well defined conditions and that the probabilities are related to the observation, not the temporal development between observations unless there are unknown external influences. The Copenhagen interpretation and many worlds interpretation are equivalent. In the first the observation tells where the particle is immediately after the observation was made, the many worlds interpretation tells after the observation that we are in such a world, where the particle is at that point. There is no practical difference at this level; whether there is one in some other situation is not totally clear, but so far they produce the same results. The real alternative, where the state was fixed before the observation and we just find out, what is was, is the hidden variables theory, but it was shown to give different results from ordinary QM for the Bell experiment (Bell’s inequality applies to hidden variables), and the result excluded the hidden variable theories. Thus the more abstractly defined QM survives and in this theory the location of a particle is not fixed before the experiment, it’s a consequence of the experiment and the experiment changes the state correspondingly. What else could it be? These are subjective probabilities, which means they are not mathematical probabilities at all. Mathematical probabilities are features of infinite series. Subjective probabilities are features of people. There is no objective or observer-independent relation between an hypothesis and its evidence. The weight of evidence is in the eye of the beholder. This is why I have little use for so-called probabilistic decision models. They are merely modeling group opinion. David – I agree with some of your comment. On the other hand, there are occasions when probabilities can be objectively equated with the frequency of an outcome as a fraction of all outcomes, and in some of these circumstances, all observers will agree. The QM discussion upthread may be an example, because based on QM, one can assign a probability to the observation that a specified amount of 14C carbon will emit a beta-particle over a specified interval. David – When you said “infinite series”. were you making the same point I was making regarding frequency of outcomes? I can only agree that the statement is sometimes true. It may not be. A good example is a coin that when tossed, comes up heads in 99 consecutive tosses, and the hypothesis is that the coin is double-headed. The frequency of that result from a “fair coin”, the frequency from a two-headed coin, as well as the frequency of two-headed coins in a population of coins are all objective data that can be utilized to test the hypothesis. Sorry Fred, but I was talking about actual scientific hypotheses, not two headed coins. Unless there is a two headed coin research program I have not heard of. Perhaps part of AGW climate research? More seriously, it is true that probabilities have a real role to play in inductive logic, mostly where statistical sampling is concerned. Statistical sampling theory is based on probability theory. So in so far as one is doing valid statistical reasoning then probabilities are valid components. But that is not the case in question, which is the general issue of evidence for an hypothesis. In this case probabilities are just a mathematical metaphor, and a misleading metaphor at that. Are you claiming that probabilities don’t provide evidence for or against a hypothesis? What is a “mathematical metaphor”? Fred, in logic it is called the foundations of mathematics. Every form of math has certain conditions that have to be satisfied before it is applicable. Probability theory is based on infinite series. This condition is not met in the case of evidence for a hypothesis. The math simply does not apply, so use of the mathematical term “probability’ is merely metaphorical. That is, there is no probability that a given hypothesis is true. That is, there is no probability that a given hypothesis is true. There are clearly many basically different meanings for the word “probability”. These differing concepts follow partially the same mathematical laws, but may differ in important ways. It is counterproductive to disregard some of these uses, but it must of course be accepted that one must be careful in matching the conclusions to the premises. Bayesian probabilities and Bayesian inference are very useful concepts. They are not without problems, but that doesn’t make them worthless. They have strong connections to statistical analysis even, when subjectivity is involved. In practice pure totally objective statistical analysis is an exception that is seldom covers fully any issues of importance. The most important applications of probability theory are more than a metaphor. It is not an accident that pure objective probabilities occur most commonly in artificial games (when nobody cheats) and only occasionally elsewhere. Objective probabilities also come up in epidemiologic and medical diagnosis when we want to know the probability of a disease or condition (e.g., prostate cancer) based on the value of a diagnostic test (e.g., PSA). The calculation is based on the sensitivity of the test (% positive tests in individuals with the condition), its specificity (% negative tests in individuals without the condition), and the prevalence of the condition in the population. The first two are involved in the construction and evaluation of the test, and the prevalence is available from data about the population. In your example the probabilities are certainly handled as objective probabilities, but looking more carefully, I think that some subjective judgments have been made in determining the values of sensitivity, specificity and prevalence. At least there must be specific factors that would change the value of prevalence based on additional information about the individual. For the games great effort is often used to guarantee the accuracy of the probabilities, in other applications it’s usually known that they are not precise and the determination and/or use of the pdf’s involves some subjective judgment. The dividing line between objective and subjective is often fuzzy. Argumentation on the value of Bayesian probabilities has a long history. I’ll not go any deeper in that. I know that some people give them little or no value, but at the same time very many have found them to be of great value in a form where the mathematical rules of ordinary probabilities are applied. How well that works, depends on the specific conditions and on the skill of the person doing the analysis. Pekka – Your thinking about sensitivity, etc. is very astute. Sensitivity and specificity are parameters that vary inversely. For a PSA test as an example, if the criterion for a positive test is set to be a value above 3, the sensitivity will be high (very few cases will be missed), but the specificity will be low (many if not most positives will be false positives). Setting the cutoff to 5 would do the reverse – cases will be missed, but false positives will be fewer. Prevalence is critical, because the utility of a test that has a potential for false positives may remain high if the tested population has a high prevalence of the condition, whereas the test may be almost worthless in a population where the condition is rare. For example, a screening test with 99 percent sensitivity and 99 percent specificity will be useful in high risk groups with a 10 percent prevalence because if 1000 individuals are tested, 99 of the 100 with the condition will be detected, and only 9 false positives (1 percent of 900) will also be found. If the prevalence is only one in 10,000, and 10,000 are tested, that one case will be detected with 99 percent probability, but the test will also result in about 100 false positives. Exactly. Based on the history of science, there is a 100% chance that every current hypothesis is not true. They are simply approximations that allow some degree of useful calcualtions. Thus, it is meaningless to ask anyone the percentage chance a hypothesis is true. Pekka, regarding your claim that there are different kinds of mathematical probabilities, which “follow partially the same mathematical laws, but may differ in important ways,” what are the laws of subjective or Bayesian probability? More importantly, what is their basis? The basis of statistical probability is well established in infinite series. What is the basis for subjective probability math? Where do these laws come from? Oh, I think you’re oversimplifying. Uncertainty comes from lots of different kinds of sources, and there are very important and useful ways to keep them separate from one another. A good example of this is the mistake I see even technically educated people routinely make in the interpretation of confidence intervals. It’s amazing to me how often people will read a paper that has measured some value given with a 95% confidence interval and conclude that we know with 95% certainty that the real value lies somewhere within it. But that’s simply not what CIs do. They give us information about the likelihood that the observed population is representative of the larger population from which they were drawn, but we must rely on other means to determine whether and to what extent the observed population corresponds to the one we hoped to observe. It looks to me like the use of intervals of probability are an attempt to cope with that limitation. It’s amazing to me how often people will read a paper that has measured some value given with a 95% confidence interval and conclude that we know with 95% certainty that the real value lies somewhere within it. QBeamus – This came up in a previous thread. I would say that the above statement is an inelegant and imprecise way of saying something that is basically true, at least under most circumstances. I would rephrase it more accurately as follows: If the data are valid and if there is no other information available about a parameter that has a true but unknown value, then the 95 percent CI allows us to conclude that if we judge the value to be within that interval, there is a 95 percent probability that we will be correct. The meaning of the CI is typically stated to be that 95 percent of the CIs calculated according to our procedure will include the true value. That statement is usually equivalent to the one I wrote above, because we could consider the CI we are working with to have been drawn randomly from a population of CIs and therefore to have a 95 percent probability of including the parameter. It would not be true if we had additional information about the value that allowed us to construct an informative Bayesian prior, but under most circumstances, we don’t. I’m not sure I see why this is relevant to probability intervals. Fred, CI’s and Bayesian priors have nothing to do with one another. You are confusing two different mathematical systems. That’s not correct, David. A CI can let us infer the probability that a parameter lies within it, but this is altered by prior information about the possible distribution of the values. Fred, I am referring to standard confidence intervals (CI) in statistical sampling theory, which is a subset of objective probability theory. These CI’s are defined by the probability distribution of all possible random samples. Prior knowledge, whatever that might mean, cannot change the CI’s. Bayesian logic is a different system, one that uses so-called subjective probabilities (which are not real probabilities in my view). If the Bayesians have something they call confidence intervals this merely adds to the confusion between the two mathematical systems. But where is the world for which you know the PDF’s, either their form or their parameters. There is a lot of mathematics that has been developed for handling the probabilities, and there is also a lot of theory developed for statistical analysis, but whenever you start to apply this theory to something real, not only something imagined by the mathematicians, you’ll find out that those problems that led to the development of the Bayesian concepts start to pop out. Sometimes they show themselves weakly, sometimes they dominate the analysis, but almost always they are present at some level. Very good comments on a very interesting paper. The influence diagrams have provided a structured commentary on the conclusion that the events of October–November 2000 were extreme, but cannot in themselves be attributed to climate change. Pesky evidence or lack thereof. It is interesting how proposition B1 looks at the historical context of the source proposition through well documented metrics and comparing them straight up with the year 2000 while proposition B2 relies on frequency and magnitude, both of which are harder to rate or standardize. Proposition B1 appears to be more black and white while B2 appears more vague. I think this quantifies my the biggest problem I have with AGW proponent statements after a some type of “unusual” weather event along the lines of “this is what climate change looks like” or “this is another example of climate change happening now” . How do you standardize a higher frequency or greater magnitude from what occurred historically? This, to me, is where all the uncertainty comes from. Am I looking at that correctly? BTW I simply listed the published global records on floods and other severe weather phenomena. The “summary of evidence” in Table 1 is a conglomerate of various scattered data points from all over the map (obviously with more “holes” than data). But your point remains valid. How do you standardize a higher frequency or greater magnitude from what occurred historically? This, to me, is where all the uncertainty comes from. Am I looking at that correctly? Well, there is the question of “how”, compounded by an even more basic question regarding the availability of statistically relevant data to start off with, which you also mention. Magnitude of anthropogenic contribution not assessed. Attribution for these phenomena based on expert judgement rather than formal attribution studies. The historical global high/low record temperature record is pretty dicey, so it is difficult to say whether there were more or less record hot or record low temperatures recorded before the latest warming period started around 1975. Based on human death toll, nine of the ten worst ever floods occurred prior to 1975, with the tenth (caused by a dam break) occurring in China in 1975, so this record doesn’t tell us anything at all. The records I have seen of severe hurricanes and tornadoes in the USA do not show any apparent increase in either intensity or frequency since 1975. The same is true for tropical storms outside the USA. Drought records are also inconclusive. As far as human deaths are concerned, studies have shown that death rates from extreme cold far exceed those from extreme heat in many locations worldwide, but this also means nothing statistically as far as severe weather events is concerned. A study by Indur Goklany showed that the death from severe weather events has declined markedly in the second half of the 20th century compared to the first half, but these data do not tell us much about severe weather events being caused by AGW. So I would agree 100% with you. The first limiting item here is meaningful historical data. And the second is the question you raise about how to standardize this sketchy data to get a meaningful statistic. Of course, one can try to “torture” the limited available data until they tell us a “story”, but that’s storytelling, not science. Interesting paper- i’ve only skim read so far, but i really like the way they addressed the issue by evaluating each possible explanation (including natural variation) and assigned probabilities to each. They also seem to be quite ‘strict’ on what they accept and do not accept as ‘evidence’ which is quite good. I didn’t see anything on this- but there’s evidence that part of the reason the floods were so severe was down to poor water-way management. Case in point, the recent(ish) severe flooding in cockermouth, cumbria (UK) was entirely down to poor waterway management (and a little rain…). Hopefully they’ve covered this aspect in the paper too and i just missed it on my quick read. My first contact to an approach similar to this was in early 1980’s when a colleague was looking at possibilities of fuzzy logic in certain problems with uncertainties. My own conclusion was then than the fuzzy logic didn’t really add to the understanding and its use might have been misleading. In fuzzy logic complete and complex calculations based on probability distributions are replaced by simpler rules. This means that something of the information content of a full analysis is lost, but the loss is not always severe, as the original PDF’s for a full analysis would have been “guesstimates” in any case. When the independence of several different factors is guaranteed to be complete or nearly complete, the full analysis gives, however, much stronger valid results. On first reading of this paper, I have the feeling that the same issues apply to this. Replacing the approach of estimating even with lacking justification the PDF’s and the mutual correlations, and doing a full calculation in that way is likely to give stronger results. The role of unknown unknowns must be added to that resulting in reduced certainty, but replacing the full analysis by this method is likely to give weaker results, whose weaknesses are in addition badly unknown. When there are unknown unknowns, no method can remove the problems. The strongest results are still often obtained through full probabilistic calculations. If an analysis shows that this cannot produce useful results due to the nature of unknowns, then neither can this method. Then a more radically different approach to uncertainties must be chosen. The methods like this may be more practicable and in some cases give essentially as good results as a full complex analysis, but always at least a tiny bit less than a properly executed and interpreted full analysis. The raw data on the elicited expert opinions would be interesting for a number of reasons, but fundamentally the result is as good as the elicited opinions of the experts. More importantly, this kind of analysis gives an objective view of where research dollars should be spent to decrease uncertainty (or, rather, provides and inout ofr this discussion – there’s no point to trying to decrease uncertainty in an area where not much progress could be expected. One of the attractive features is the inclusion of quality metrics in the analysis. I would much rather have a higher category than auditable one for actually audited, but this would knock out most papers. This elegant little model is most important in that it represents the issue as a tree structure. It ties the general proposition of (local) climate change to multiple lines of evidence. It also gets the right answer, which is encouraging. It also demonstrates and references an ongoing research area of formal analysis of the logic of the debate, which is useful. Interestingly it mentions arguments against quantitative probabilistic analysis, which is my view, so I have little to say about the numbers side. The tree topology is what is most important. However, because the influence tree seems to be limited to causal or evidential relations, it misses most of the logic of the debate. Arguments over data quality for example, or over the plausibility of speculative causal connections. In other words, it is not a full scale issue tree. It is also very, very small. Still, by at least hinting at the actual complexity of the logic, it is very useful. I understand that it is not relevant to this thread but everyone keeps talking about the problems with climate science and communicating messages, I don’t think there is any connection between floods and climate change. When I think about global warming affecting the weather, I say to myself “What nonsense is this? Do people think there is a giant black cloud of co2 swirling around the atmosphere that magically causes natural disasters? I basically see discussions like these as trying to reason against inevitability. This is really basic stuff. It then compares the dollarized damage reported from storms from 1960 to 1997 and claims that the increase in damage is evidence of the increase in storms. The use of this data in this way is either simply stupid, or an intentional attempt to mislead the reader. The data does not take into account inflation during the referenced time period and values a 1960 loss as equal to a loss decades later. In addition, it does not take into account the additional density of people living in areas affected by storms during the referenced period. Do you believe for example that the same number of people would have been negatively impacted by a storm in Los Angeles in 1960 as in 1997? Holly, I think you are probably right about increased precipitation being caused by global warming (whether anthropogenic or not, of course). However there is little evidence to show that there is a real increase in extreme weather events, for instance the recent and much hyped Queensland floods were notably less severe than previous events over the last two centuries. And the link you show is quite disgraceful and certainly does not qualify as science, economics or any other half way honest discipline. Interestingly however, rain seldom falls from clear skies, it usually comes out of things called clouds, which whenever I go outside tend to cool the surface temperature. My uneducated pound is firmly placed on the bet that this is what might technically be termed a negative feedback, and a large one at that, offsetting the effect of CO2 on global temperatures. 2010 is in the books: Global Tropical Cyclone Accumulated Cyclone Energy [ACE] remains lowest in at least three decades, and expected to decrease even further… For the calendar year 2010, a total of 46 tropical cyclones of tropical storm force developed in the Northern Hemisphere, the fewest since 1977. Of those 46, 26 attained hurricane strength (> 64 knots) and 13 became major hurricanes (> 96 knots). 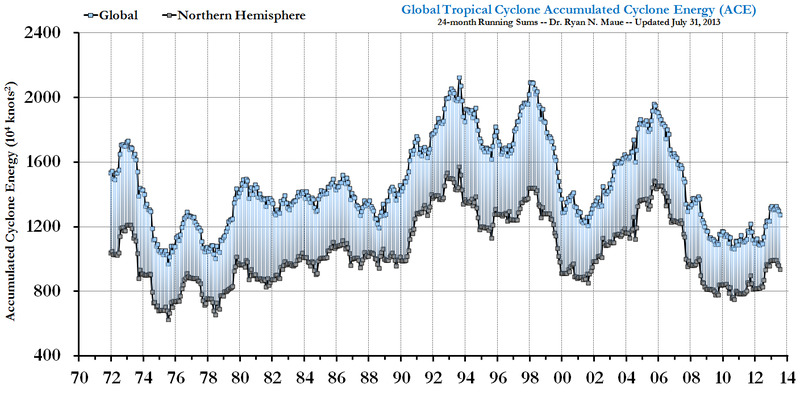 Even with the expected active 2010 North Atlantic hurricane season, which currently accounts on average for about 19% of global annual hurricane output, the rest of the global tropics has been historically quiet. This work may be cited as Maue (2009) or Maue and Hart (2011). There is something called the evaporation paradox which sees declining evaporation at land stations globally. An example from Australia is shown here. Evaporation is driven by changes in insolation (as well as wind speed and relative humidity) – the increase in which I think is most probably dominated by cloud cover change in the mid and eastern Pacific as a result of the the Intedecadal Pacific Oscillation (IPO). So a natural variation driving decadal changes in regional rainfall and modest changes in global rainfall totals. We always seem to proceed from the unstated assumption that ‘most’ recent warming was anthropogenic in origin. I don’t think that is obvious either. The biggest change in ERB occur as a result of changes in Earth albedo – cloud, ice, land cover etc. We have qualitative evidence of cloud change in the Pacific (Burgman et al 208, Clement et al 2009) and quantitative satellite evidece from ERBS and ISCCP. This for instance is the ISCCP near global mean albedo anomaly – a change of 1% in albedo is a change of 3.4 W/m-2 in the ERB. Some people reject the ISCCP-FD data on the basis of problems with viewing low level optically thin clouds – but this doesn’t affect measurement of reflected shortwave (Norris & Slingo 2009) and thus albedo. Most rainfall originates in oceans – it is just the basics of the hydrological cycle. Personally – I think it is inconceivable that Earth albedo doesn’t change. I am distinctly unimpressed by the simple and misleading UCAR narrative on the site you linked to. The near constant relative humidity in the models is not supported by data. See for instance AR4 – http://www.ipcc.ch/publications_and_data/ar4/wg1/en/figure-3-20.html. The increase in specific humidity – which must increase if rainfall has increased – is much less than what is calculated with the Clausius/Clapeyron equation. change in the tropical and sub-tropical Pacific. As for quantification – the ISCCP-FD data is discounted by many on the basis of a difficulty in viewing optically thin low cloud. This does not, however, translate into a problem with measuring reflected shortwave. (Norris and Slingo 2009 -http://meteora.ucsd.edu/~jnorris/reprints/02_Norris_and_Slingo.pdf). The correspondence with ERBE since the 2006 Wong altitude correction gives added confidence. See – http://isccp.giss.nasa.gov/zFD/an9090_ALB_toa.gif – a 1% change in albedo is a 3.4 W/m-2 change in radiative flux at TOA. This is an order of magnitude greater than the change in anthropogenic forcing over the period of record. You can see that albedo has increased since 2000 – consistent with decadal changes in cloud. Thinking about hydrology as global means glosses over a great deal and there is really a lot that we don’t understand. Robert – Why do you say that the 1.2% precipitable water increase per decade is inconsistent with CC when the temperature during that interval rose at a bit more than 0.2 C per decade globally and I believe at a slightly slower rate over the oceans? I interpret is as consistent with constant relative humidity. The increase in water vapour in the atmosphere (specific humidity) was somewhat less than 7% per degree – and that must result in a decline in relative humidity. Having linked to Trenberth – I have to say that I heavily discount the validity of theory or the value of global models in hydrology. Hydrology is chaotic, highly variable regionally and temporally, we have limited data and theory is almost always empirical and approximate at best. I don’t think there is much disparity. Ocean temperatures rose less than 0.2 C per decade according to HadCrut 3 (starting at the end of 1987 through the end of 2004). I didn’t happen to see ocean temperature data for RSS, but based on the HadCrut data, the relationship comes out close enough to 7% per degree C to be consistent with constant or very near constant RH. You need to be careful about crude linear calcs. I think two points are important here. The vast bulk of atmospheric water vapor is below the upper troposphere, and so near constant relative humidity is determined by the overall water vapor content, with upper tropospheric relative humidity contributing very little to the average. Whether upper tropospheric RH has remained constant or, despite specific humidity increases, has not kept pace with overall RH is a matter of uncertainty. The Minschwaner paper suggests a reduction, but a later paper by Soden et al examining data over a longer interval finds evidence for a constant upper tropospheric RH – Upper Troposphere Moistening. The article is behind a paywall, but the method involved radiance measurements of water vapor indicating that in concert with warming, the altitude of water vapor infrared emissions to space had risen at a rate commensurate with constant RH. Chief – thanks for your further comments. It all seems to fit together very well and makes a great deal of sense to me. Whatever the drivers of ENSO/PDO, the evidence seems to suggest it results in significant changes in cloud cover and albedo that has a disproportionate affect on the energy budget. I can’t understand why these “hydrological” ideas don’t attracted more attention. The bottom line is that NASA seem very confident in their SH and RH measurements. I can’t access your paper behind the pay wall, but Chief’s cited evidence seems quite strong to me. Have you got any more info on RH in the lower atmosphere? Rob – The constancy or near constancy of overall RH is well established (for example, see the AR4 Figure 3-20 that Robert linked to above) whereas the data for the upper troposphere are less certain as I indicated above. For overall RH, the data have been gathered via 5 different reanalyses, with the more recent ones including satellite data. These all agree on the same conclusion of increasing SH and constant or near constant RH except for the NCEP/NCAR reanalysis, which utilized the older radiosonde measurements without the satellite data. That analysis is now known to be spurious due to changes in instrumentation that led to downward jumps in recorded humidity. I believe the SSPI article you mentioned earlier chose to pick that single analysis to derive its conclusions, but this is an example of why Internet sources are untrustworthy for accurate perspectives. The AR4 diagram refers to an increase in specific humidity 0f 1.2%/decade and not relative humidity at all? The decline in RH is 0.07%/decade (70S – 70N) – http://www.metoffice.gov.uk/hadobs/hadcruh/data/version2_diffs.html – but about twice that in the tropics. Is this close enough to constant RH? It is far from the major issue and your arguments are a pointless distraction at best. Yes, even though the link refers to surface relative humidity rather than overall RH, which has remained nearly constant, those data also show near constant RH. The only region where there is still uncertainty regarding constant or near constant RH is the upper troposphere, where SH has increased, but whether or not the increase has maintained constant RH is still unclear. The near constancy of RH is further confirmed by the AR4 diagram if one also compares the figure with the increase in ocean temperature over the same interval. I have warned you against eyeballing in crude linear interpolations over the blogosphere. If you persist in this errant nonsense – Sir – I shall be forced to demand satisfaction on the field of hydrological honour. And cheery picking a single paper which insists that specific humidity in the upper troposphere is ‘consistent with’ constant RH will not help you. It all seems ‘consistent with’ the ‘near constancy’ of relative humidity. Except the direct satellite measurements of RH – not to mention the radiosonde data and surface RH. ‘UARS recorded both specific and relative humidity in the upper troposphere. Specific humidity refers to the actual amount of water vapor in the air. Relative humidity relates to the saturation point, the amount of water vapor in the air divided by the maximum amount of water the air is capable of holding at a given temperature. As air temperatures rise, warm air can hold more water, and the saturation point of the air also increases. In most computer models relative humidity tends to remain fixed at current levels. Models that include water vapor feedback with constant relative humidity predict the Earth’s surface will warm nearly twice as much over the next 100 years as models that contain no water vapor feedback. Contrary to Fred’s claim of diminished influence of water vapour in the upper troposphere, the upper troposphere is most important as this is where water vapour has the strongest greenhouse effect. It is still a minor point – but Fred wiggles like a worm on a hook and that is the important thing. I am sure he just makes it up as he goes along – but we will let the reader decide on that as Fred is so fond of saying. Dear reader – you can easily go back and compare my statements – with diverse topics and interesting references (worthy of a fox I suggest) to the stodgy one idea claim of Fred (surely a hedgehog) – with a single not very persuasive or indeed relevant reference – repeated endlessly with no colour, imagination or verve. Hi Robert – I think you should quit while you’re behind. Seriously, the constancy or near constancy of RH overall is now established by all the sources you and I have both mentioned, while the upper troposphere is still a source of some uncertainty. You’ve quoted one source (Minschwaner and Dessler) concluding that upper troposphere SH does not increase enough to maintain constant RH, and I cited a later one with a longer observational interval (Soden et al) that finds a constant upper troposphere RH. Anyone interested should visit the sources rather than referee exchanges here (assuming anyone is paying attention at this point). Does it matter? Well, the increase in SH is critical to the conclusion that CO2-mediated warming is associated with a positive water vapor feedback. Constant RH would make the strength of that feedback stronger than if constancy is not maintained. As you mention, the upper troposphere is the altitude where water vapor greenhouse effects are most responsive to concentration, and so it would be nice to know exactly how well RH is maintained there. As it is, we know that the increase in SH means that a positive water vapor feedback is operating, but we can’t be sure at exactly what magnitude yet. There have probably been enough sources cited already for others to make their own judgments after visiting them, and so I’ll refrain from further comments unless some startling new evidence comes up. Your original question related to constant relative humidity – and how as I said it wasn’t supported by the data. Below is the abstract from the Minschwaner and Dessler (2004) paper – which you dismissed on the basis that it dealt with the upper troposphere. It uses MLS and HALOE data to measure specific and relative humidity in the atmosphere. The Soden et al (2005) reference used clear sky HIRS channel 12 data to measure specific humidity. I did link to AR4 – so I am far from either disputing the rise or misunderstanding the significance of specific humidity in the atmosphere. This is your contribution – ‘The vast bulk of atmospheric water vapor is below the upper troposphere, and so near constant relative humidity is determined by the overall water vapor content, with upper tropospheric relative humidity contributing very little to the average.’ But as I point out – it is the very point of maximum impact. Unless you can come up with something else that directly measures relative humidity and does not show a decline – I am done with you and your pointless niggles. Then you start off with a snarky comment like you did and as always finish with a dismissive and insulting refraining from further comment refrain. It only works once Fred. I’m still here reading this. This has been a fascinating and very illuminating exchange – thanks to both of you. Sorry for initiating it!! Rob – You’re welcome (from your pointless, prevaricating, niggling, snarky, face-saving, ignoble Internet friend). Fred has an unfortunate adversarial style, leaps in and then modifies a narrative as he proceeds, is adept at subtle slights, refuses to admit to any error in interpretation and must have the last word. It makes it difficult to explore topics openly and collaboratively. I started with this comment – thinking about hydrology as global means glosses over a great deal and there is really a lot that we don’t understand. The Minschwaner and Dessler study is convincing on declining relative humidity over some of the same period. There is no theoretical necessity for constant relative humidity – it is simply a convenience for modellers. ‘There are several plausible mechanisms for creating a negative water vapor feedback in the UT (see, e.g.,the review by Held and Soden 2000). One oft-cited mechanism invokes the drying effects of deep cumulus convection…’ (M and D, 2004) However, there does not seem to be an actual negative feedback – just not as positive as assumed. Chief – the link is to the same paper as the one in the comment above? Too many G&Ts? Would you believe a deliberate distraction from my more Americans believe Elvis was abducted by aliens than AGW statistic? No, it is not so basic. Notice that a premier meteorological organization like the UK Met has even not been able to do what you say is basic. Extreme events, when measured by any honest standard, are trending flat. Shouldn’t extreme events trend downwards, normally? I mean, once you’ve had your most extreme day in the century, won’t your next most extreme day more extreme than the current record be that much more difficult a mark? Isn’t the expectation not only decreasing, but logarithmically decreasing? I have debated on RC several times with no problem. Ranting and serious debate are two different things. I have to say, I’ve only once tried but I mentioned McIntyre so my comment never got through (probably because it was drunken nonsense) about 5 years ago but since then, because of there alleged reputation, I have not tried. How many others are there who have ‘not tried’, merely on the bases of a second hand reputation? If one have a theory one must test it? Note: this is a technical thread, comments strictly moderated for relevance, i just deleted a number of comments. Take these kinds of discussions to one of the discussion threads. The November 2000 floods were bad but not exceptional. There were similar floods in the 1970s and worse in 1947. The 1947 floods were cold-related – thawing after a bad winter. I like the paper overall, but I have a slight potential concern, There is a method whereby consensus os achieved between the experts. I wasn’t clear to me the exact method. Also, by taking a consensus approach, they are left with what to do about cases where consensus isn’t achieved – they have to change methods to incorporate the non-consensus information. It isn’t clear to me that this feature doesn’t artificially increases the uncertainty numbers for no-consensus vs consensus items. I don’t see this as a significant flaw, but would be something to be aware of when interpreting the final numbers. I know this is off topic – so sorry. But perhaps there is a tenuous connection floods-tsunami -Japan’s nuclear problem. I would like you to introduce some rationality to the, at present, understandable irrationality that is surrounding the nuclear option. If we contrast the deaths and injuries produced by the coal industry verses the nuclear we would see a pretty one sided equation. I know this is not your subject but it would be good to have a sane voice speaking in this debate. Lewis–while I agree, there would seem to be a need for executive leadership from those who have a degree of political standing withing the “environmental community” in order to get much traction on this topic. Rational behavior would seem to suggest that those concerned with additional atmospheric CO2 would be the leading advocates for the implementation of modern nuclear power. The fact that this is not the case suggests that rational behavior is not being adopted by those concerned by atmospheric CO2. Just to continue a thread that ran out of space above, I have no quarrel with Bayesian statistics, as long as people realize that they are basically a form of opinion polling. Hence they are subject to the usual problems facing polling studies and opinion surveys. The derived probabilities should be described as “personal probabilities” or some such term. In the case of AGW, where opinion is clearly polarized, these statistics should be presented in such a way as to show the polarities, not to mask them. In fact it is questionable how valuable these analyses are in a polarized case. 1. Is this an appropriate method for the decision to be made? Voting principles for example are invalid in mathematics and science while strong in matters of fashion and taste. Will the method be able to use all relevant information? Will the method adapt as new information becomes available within the scope and scale of the decision? 2. Can it arrive at a correct and timely outcome? Can ‘correct’ only be identified after great cost and delay? Is ‘correct’ a matter of logic, other reasoning, popularity, capital, labor, philosophy or pragmatism? 3. Can incorrect outcomes be detected and avoided? How early in the process can error be detected? What value to the decision process can be gained from errors? 4. Is it insensitive to Agenda Management? Does the order of sub-issues determine outcomes? Is the outcome determined by non-explicit terms or dependencies? What idiosyncratic outcomes are possible? 5. Does the method self-correct for ill-formed problems? If the ‘wrong’ initial question is asked, can this be detected and parleyed into a better focus? How does the method account for scope and scope creep? 6. Is the method auditable? Can every step in the process be both validated and verified? Can every source be attributed to its author or origin, and the qualities (eg error bars, bias, precision, etc.) of the origin identified and evaluated? ill intentional or pious deception be detected and corrected? 8. Will the method only allow trivial decisions? Can the method only tell us what we already know? How much power does the method have to deal with complexity and other obstacles? Does the method offer advantages over other methods? Is the method one among many comparable methods, or if distinct is it entirely incommensurable? Can the method dovetail with other methods advantageously? 10. When will it end? How can we most efficiently proceed to a correct outcome? How can we gain acceptance of a correct outcome soonest? In regards to decisions regarding global CO2 emissions I suggest that another question needs to be asked and that is- What is the probability that actions can and will be implemented that will result in CO2 levels being “X” by year “Y”. People in the United States will have a tendency (imo) to reject providing funding to other nations to help them to implement a project to reduce CO2 emissions. This is especially true with the nation’s budget situation and it is going to become especially true once the government starts actually cutting spending. For the 70% + of the world who’s CO2 emissions will be going up (vs. the US going down both on a per capita basis and in total) what is the likelihood that of them lowering or delaying their development? While you have valid questions and opinions, questions and opinions aren’t methods; valid methods we are in much shorter supply of than valid questions or opinions. Suppose the policy solution happens to be one that overwhelmingly appeals to people, and begins in the USA? Wouldn’t we want a method to get us to that best possibility, rather than one that leaps to your equally valid, opinion of what may come? It’s more useful when picking a method to not first pick the outcome you want and then pick the method that produces your favorite outcome. One suggestion I’d make is the replacement of “correct” and “incorrect” with “optimal” and “unfavorable” (or “suboptimal”), given the role played by uncertainty in the process. Though it’s rare, however, there are cases where ‘correct’ is a more apt term than ‘optimal’ in satisficing decisions. ‘Optimal’ may be too strict a condition in these cases. ‘Favorable’ is an excellent alternative, as there are times when ‘correct’ is too strict a condition too. Agreed, “favorable” would seem to be the most applicable. I have a deep skepticism regarding the “one true path” outlook, but I will concede that “correct” works in some cases. By the same token, “optimal” may be too high a bar to set when the uncertainty level is high. I’m not sure what you mean by voting principles, or how it relates to this topic. Exchanges, for instance, are fundamentally a voting mechanism, and have been proposed for evaluation the possibility of climate disaster. Personally, I have my own techniques (single expert as well as consensus)which I’ve used over the years in predicting what technology will do in the future (or rather, underlying technical requirements). What’s shown in the paper is similar but not the same as the techniques I have used, so I’m pretty comfortable with them. To be clear, the predictions included things like fundamental physics based performance parameters of transistors, whether current materials could be used, and if not what would replace them, etc. I still view this as science, even though it can be argued that it’s engineering. Other techniques I used for other purposes (like asessing patent portfolios for possible future licensing agreements). I regretted my word choice in that line almost immediately. Your reasons amplify the worries I have. It may be better to say that mathematics in particular and science (and engineering, etc.) in general seek to deprecate voting with more immediate methods, though it is inevitable that some ‘voting’ will participate in almost every case at least early on. Where there is a consensus, it may be still preliminary pending rigorous investigation; where there is too little evidence or too much complexity, expert (or even sometimes naive) opinion is often valuable. Looking at the particular case of attributing floods to human factors, it is noted in the study that there are other choices than to use opinion to form the basis for decisions; if these other (evidence-based) choices can be shown to be at least as reliable as the opinion, then certainly there is a mandatory argument in science to jettison opinion for evidence. Bart, how can you “jettison opinion for evidence” when evidence is a matter of opinion? You sound like Fred, who seems to think that evidence is a measureable thing, independent of human interpretation. In complex cases like AGW, the weight of evidence is in the eye of the beholder. Fred and I look at the same evidence and come to opposite conclusions, or so it seems. In the case of the policy method, is not the method the (act of)interpretation, and opinion also just another type of evidence within the act of interpretation? So in your epistemological argument, you refer to meta-opinion? I could certainly jettison the results of a vote of the Indiana Legislature on questions about the value of Pi for the results of a formal mathematical proof of the valie of Pi. The opinion of the Great State of Indiana would be meaningless to Pi. I can jettison the opinion of countless people signing a census to ban this or that supposed health threat in exchange for a carefully researched health effects study. Though the health effects study may contain, and express, expert opinion, it does so on a foundation of data, evidence, a formal body of knowledge and what is entailed in the philosophy of the scientific method. There are most certainly more and less valid interpretations of data, if one exposes the methods of interpretation to questions of their validity, separated from personalities. For example, while I have high regard for both yourself and Fred, I note a preferene to utilizing Fred’s posts as they are generally more highly methodical and expository, demonstrating and explaining the steps in reasoning he applies in clear and ample ways including source data. Not Fred over David, nor Fred’s conclusions over David’s, but Fred’s methods over David’s. I really have no idea what you are trying to say. Sorry. Unless you are saying that good opinion is better than bad opinion, to which I must agree, but so what? Lamentably, I too lack the clarity of Fred’s methods. I say it is best to disparage opinion when compared to data, even recognizing that interpretions of data are opinion. Opinion is not equal to data, else why take actual measurements, why collect direct physical evidence? Not all opinion is equal; each opinion is interpretation, each interpretation has method: the ten categories of questions I began with suggest I am deeply skeptical of each methodology unevaluated, hence of non-transparent interpretation, hence obscured opinion, for sound reasons. I really have to work on keeping my answers short and simple. The phrase ‘more immediate’ I used above is what I meant. “Data + less interpretation” is more immediate or explicit than “Data + more interpretation”. Far better when deciding to decide on the most explicit form of the data available, where the interpretation of that data is still true. That way, we know what method was used to obtain the data, what data and methods are included, what we are relying on, what the answers to our questions about the validity of those methods are, and that we are the ones responsible for interpreting our sources, not some intermediary. Fred and I look at the same evidence and come to opposite conclusions, or so it seems. Skeptics and IPCC look at the same evidence and come to opposite conclusions. What answers do you get when you apply the ten categories of questions I ask about the methods used for each of your examples? Not of the people, or of the conclusions, but only of the methods? It is very difficult to refute any interpretation. The only refutation of an interpretation is the actual observation. Whether IPCC’s accelerated warming or skeptic’s natural warming/cooling is the correct interpretation will be established within this decade. Like the past decade, if there is no warming trend in this decade, then we sketpics would be correct. I disagree, in that I believe we’re slightly talking past each other. I suggest it’s easy to refute a type of interpretation, based on the method of interpretation, if the method is inappropriate, or significantly fails any of the ten categories of questions about method I propose above. I’m a skeptic, but I don’t count myself as an AGW Rejector (nor Acceptor), and so I see no validity in your conclusion. Further, your premise is, how to say it? Specious. Defunct. Babble. Meaningless. Baseless. It relies on graphical methods that are not widely accepted and statistical arguments you never address questions about. You can satisfy yourself of your correctness, as belief is seldom overthrown by superior fact, but you will not be correct until you address these methodological concerns. Any one, yes, any one, who sees the following data will conclude that the global mean temperature is cyclic with an overall warming of 0.06 deg C per decade, and there will be cooling until 2030. Let the observation be our judge. Respectfully, if all one had were those lines on that graph you supplied and nothing else, anyone might be excused for suggesting the graph could lead where you propose, within wide uncertainties. However, we have much more information than your misleadingly cherrypicked graphs depict, and a wider framework of knowledge on which to base our logic. Further, we must ask what benefit is there to delaying until after the fact certain prudent principled decisions that will exercise homeostatic effects on changes we introduce to the wider system while growing and improving our economies? What is your objection to a revenue neutral carbon tax proposal that delivers both the democracy of the open market and the efficiencies of internalizing decisions that are now needlessly treated as externalities, with the bonus that each of us receives fair revenue in exchange for our consent and measure of insurance against risk-increasing ventures? In a world where billions live in poverty (lack of energy), to artificially increase energy prices is simply callous. Without evidence, to scare an ignorant world with man made catastrophic global warming and inundation by the sea is extremely callous. Experiment is the sole judge of scientific truth. There are different approaches for different circumstances. Hard data is preferable to have in deciding whether there is a problem or not. Wasting a lot of time and money implementing solutions to problems which may or may not be real problems is a major risk. On the other hand, if there is an urgent definite, known problem, action frequently has to be taken without hard data as the primary basis for determining the best action. Under these circumstances, you do the best you can as carefully as you can, even if it means polling experts. Actions that are costly and/or difficult to reverse are typically put to the bottom of the list. The search for solution zones or evaluating possibility spaces is, in themselves, exercises in judgement. I was always painfully aware of how much reliable information I didn’t have (there’s always a temptation to try to tease out more than what is there). It was almost always more important for me to not be wrong than to have an optimal action. An action plan that was designed to be able to adapt over the likely solution zone or possibility space without having to really change course was always desirable. There are probably as many strategies and tactics on how to do this as there are people doing it. For my part, I dealt with very complex technology questions, and since there were thousands of dependent variables, hard data would indicate problems when there were none all the time – a simple matter of statistics. Again, that was with hard, irrefutable data. The number of potential catastrophes and the variety of ways they could come about is probably in the hundreds – I haven’t researched this. Hard current data on all of them would still give, lets say, a dozen or more “definite problems”, even if there were no actual problem at all. Not all methods are appropriate to all circumstances, and some are distinctly inappropriate. To my mind, Simplification is a powerful method for problem resolution applied to AGW. Looks like I’ve opened an italics leak. There are 2 points to be made. Firstly is that there is more than 1 problem in the world. There are other more important problems to spend limited funds on. The second point is how efficiently dollars are spent. We can spend a dollar and get 2 cents of value or we can spend a dollar and get $11 of benefit. Which way would you go? Which leak in the bottom of the boat do we plug? In Economics, you plug leaks in the order that increase your leak-plugging ability fastest. Ross McKitrick has demonstrated some of the benefits of internalizing this problem to the market. If his method were generalized to all externalities that could be plausibly administered on the same basis, then the market, thus the economy, would increase in size, the proportion of the economy that is government spending falls. Oh, btw, at about the 10 minute mark, the cold death argument is specious. There’s no evidence more heat waves mean fewer cold waves, and strong argument for more of each with higher CO2. Are these arguments true? Dunno. Is _his_ give-away air conditioners argument true? Less so. There is no chance of global reductions in carbon emissions without low cost alternatives. Especially as the world is not warming for another decade or 3. There are many people who are delusional on this. I would spend $100 billion a year on research but nothing elsewhere. Even that is unlikely to happen because of the usual political idiocy. Global economic development is the key to everything – nothing will happen unless people do it for themselves and capitalism, good governance and open markets are what the basis of economic growth and individual freedom. Could you clarify, is your proposal to spend $100 billion a year on research and nothing but (wrt climate) for three decades? Is this based on the belief that the only possible harm of CO2 is from heat? Certainly, we know this is simply untrue. It appears you also say the only harm of heat is due temperature level opposed to rise from natural variability. If climate is, for good but disputable reasons, generally regarded as the average of conditions over three decades, then the conditions of the next thirty years will heavily influence the climate of the next six decades, no? Industry has long run-up times, I’m sure you know. One of the big problems Japan faces today is that a 40-year-old nuclear reactor is still operating, and that reactor itself had how many decades before planning, preparation and design before it came onstream? Doesn’t your proposal mean that the future will still be contending with your $3 trillion boondoggling delay for more than a century? Since decades before my own birth, fusion power has only been 50 years from being practical. It still is only 50 years from practicality. Fusion has had a lot more than $3 trillion in research in all this time. Does climate seem more, or less, straightforward than the structure of the Hydrogen atom? Even Bjorn Lomborg’s researches are susceptible to this confusion; he’s apparently in an interview with the Guardian repudiated many of the opinions he expressed commitment to in the RSA presentation you linked to. Will year 31 of this research flip-flop, too? So what you propose seems to me mere obfuscation, and the promise of a decision to continue the status quo without consultation of the democratic voice of the market for at least a century while academics and their bureacratic handlers frollic at the public trough. My proposal is harness the decision power of the democracy of the market by internalizing the decision to the economy, instead of keeping it as an externality at the mercies of central planning committees and neglect. Put a price on GHG emission at the level of maximum returns to the shareholders in the GHG budget of the atmosphere — all of us, per capita — and pay that rent to the stakeholders directly. Don’t be bullied by farmers or cement industrialists, oilmen or car makers, into believing that they are indispensible to your life — we’re all equally indispensible to each other in the open market. Don’t be held to ransom by these corporate charities as people have allowed for the past century. Don’t be a hostage to industrial communism. And whatever else, don’t believe when people tell you what to think needs more study before you judge for yourself. It is because there is no real alternative. It is simply not going to happen in the real world. It is not my idea, my proposal or my choice – it is simply a rational analysis of the global dynamic. The only solution is energy technology with lower costs – market transformative technologies. Now you may not believe that is possible – many don’t – but if not we will do the full atmospheric experiment. In Australia we are ‘debating’ a carb0n tax at a price that doesn’t pay for substitution, half goes back to consumers, 30% goes to ‘trade exposed industry’, and the rest is spent on carbon farming. Oh please. Why not just spend the 20% on carbon farming – about $2B – another $2B on R&D and $7B on focused aid? It is because of the tragedy of the human condition – the one where most people are idiots. I empathize with your angst. Rational analysis of the global dyamic? Which particular global dynamic would that be, Chief? And what expertise could possibly expand to cover so wide and complex a global human dynamic? Is this a rational analysis of trade, politics, economics, international treaties and laws, engineering, culture, what? Belief in market transformative technologies is almost the entire sum of my protracted and nomadic academic career. You need research to get new technology, true, but to get wide adoption of new technology you need 1) competing markets to start the ball rolling by adopting new technology aggressively to drive the process of technology shift through economic advantage and introducing taste for change, and 2) wealth in the hands of individuals to power the market in new directions. Who dives in first catches the choice wave. If you’re not the lead dog, the view never changes. Get the politicians and technocrats out of the way and the people will move technology forward. In Australia we are ‘debating’ a carb0n tax at a price that doesn’t pay for substitution, half goes back to consumers, 30% goes to ‘trade exposed industry’, and the rest is spent on carbon farming. In my non-newspaper-informed apolitical opinion, this seems a sadly over-interfered with pie cooked up by people not sure what to be committed to advised by people who have kept up with the technical topic (if they’re floating the phrase ‘energy-intensive trade exposed industry’) but have no real commitment to abandoning government subsidy of commercial enterprise. On the other hand, any carbon tax that can grow more revenue neutral and put more money into the hands of those who own the rights to air shows promise of a step in the right direction — putting an end to theft and free ridership. Sad that it’s wed to industrial subsidies. Oh please. Why not just spend the 20% on carbon farming – about $2B – another $2B on R&D and $7B on focused aid? It is because of the tragedy of the human condition – the one where most people are idiots. Principle. Before, all the money that will be collected by the owners of the air from the carbon tax in Australia was stolen from them. Now, only half of the carbon tax is being stolen. How much better a deal is that? Australian politics are an oddment one cannot from this side of the globe remark on except to sound uninformed and arrogant. It’s your country, you’ll have to come to grips with your own problems. As a general principle, McKitrick and Adler and Pigou are not wrong about internalization. In truth I am a fox in sheep’s clothing and it is time for you to put up or shut up – difficult as that prospect must be for my poor, poor Bart. What makes you think you can or should appropriate the air. I suppose if you came across the wood smoke from a Kalahari campsite – you would tax the hedgehog roasting in the coals? Not only are Africa, India and Asia not buying into the shell game that is 21st century environmental economics but I cheer them on. Half of them haven’t heard of global warming and the other half don’t give a rat’s arse. I have personally spoken to each and every one of them – and they assure me this is the case. Mind you – I could probably say the same thing about America or Australia. Only brave Britain, plucky New Zealand and …well no one else really (Europe generally is just a basket case)…are fighting the good fight. We actually like New Zealanders – in a pinch we always send them over the top first. It is indeed a strategy I have used with greenies as Vice-President of the Jervis Bay Protection Committee – literally sending them out onto a bombing range. What fun that was. I was more than half hoping the American Navy would open up. Another G&T my good man. Now where was I? Oh – yes. Whenever I hear the word internalisation – I reach for my pistol. Oh – and I did say that the deserving poor would get half the tax back. The implication is that they would pay the whole tax and more through increased prices and get half of it back. You didn’t think for a moment that the great unwashed would not get screwed did you? Man – it’s what makes the world turn ’round. Australian foxes are an invasive species remarked for causing significant damage, no, Chief? What makes you think you can or should appropriate the air. Chief, surely we’ve been through this floor-ceiling thing before? By what Americans call self-evident, free air is clearly a shared common and indivisible right of all people, never surrendered to any government nor invested in any proxy agency. We all must draw breath. The system of the world’s living things once maintained homeostasis, a dynamic equilibrium of CO2 level with regional, diurnal and seasonal variation. There was once a broad sweep from 180-280 ppmv of the stuff, with rare instances of 300 ppmv. Surely, then, the natural floor for CO2 level is 180 ppmv, and the natural ceiling is 280-300 ppmv. Once we exceeded 300 ppmv, we entered an unnatural condition, with other ceilings associated with the risks of this elevated CO2 level, outside the realm of what could have in 1776 — the natural year to set as the start of all human rights — called a right. I suppose if you came across the wood smoke from a Kalahari campsite – you would tax the hedgehog roasting in the coals? I’d suggest that the Bushman scrabbling for existence in the hardships of the Great Thirst is as deserving of his share of the income from the risks his region endures due to the rise in CO2 as anyone else. Perhaps once he’d been paid for this risk, out of that large payment we might ask the tiny fraction he himself costs us who thrive on coal dust and petroleum. Stay with us, Chief. Lucidity. Focus. Breath. Set down the gin and tonic. Remember, it’s not the same Land of Oz as Dorothy visited in a dream. Tenuous grip on reality. Keep some of it. Huh. I counted over two dozen independent jurisdictions ‘fighting the good fight’ last I checked. Yes. Australian folklore, music, history and popular culture certainly do lionize those who send others over the top first. Another G&T my good man. Now where was I? Oh – yes. Whenever I hear the word internalisation – I reach for my pistol. When did Australians regain the right to bear arms? Oh – and I did say that the deserving poor would get half the tax back. The implication is that they would pay the whole tax and more through increased prices and get half of it back. You didn’t think for a moment that the great unwashed would not get screwed did you? Man – it’s what makes the world turn ’round. Chief, you’re much better at math sober. I, like you, find your politics mind-boggling and incomprehensible. That you’re imbibing G&T’s and I’m on the far side of the globe, equally adequate excuses, one expects. That there’s some particularly bad implementation of a good idea proposed by your politicians doesn’t mean the idea isn’t good. It means your politicians stink. To clarify, how many G&T’s are we talking here? Yes indeed. We have committed to a reduction of CO2 to 108% of 1990 levels – and we achieve it by not cutting down trees – (memo to the UN – agree to this nonsense or the tree gets it?) . How’s that for cunning as? It’s rather a tragedy of the commons deal. By definition no one owns the damned air – so there is no incentive to not change it and every incentive for everyone to maximise their return. It is quite clearly divisible by zero and so not defined. So sue me. Homeostasis according to the Bible … no wait…that’s something else. I am not saying there isn’t a problem – but come now – you’ll have to come up with something better than homeostasis. Much of middle America will assume it is a work of the Devil. Even now – more Americans believe Elvis was kidnapped by aliens than believe in Anthropogenic Global Warming. We could actually do quite practical things in Africa – but thankfully the Sahel is greening up quite nicely by itself. Turns out to be due to decadal changes in regional rainfall mediated through persistent standing patterns in ocean/atmosphere coupling. I’m not sure CO2 is the biggest risk – or that we have a solution. We get back to Bjorn Lomberg and opportunity cost (which hole plugged is the most cost effective) – and I hope this is the end of it as well. Well OK – I haven’t spoken to everyone personally but I did email Bob Geldof. He seemed to have a grasp of a different reality to mine however. I have commissioned a study to determine which planet he is on. I assume you mean the Annex 1 countries – R0TFL0L. Do you know any that succeeded without nuclear energy or moving to North Sea or Russian gas? Please I beg you – this is the straw that broke the camel’s back. Let’s stop with the animal metaphors. I don’t know – I’ve never tried. Duh! You know a politician that doesn’t? In which alternate reality were you hallucinating at the time? I don’t really know what to suggest. The fantasy of taxing carbon and depositing the proceeds in the bank accounts of the Kalahari Bushmen is, frankly and much as I like the movie, out there with the Pandorans. Are you sure you aren’t channelling James Cameron? PS – if you see Bob – let him know his friends are thinking of him. While I think of it – there is one other option for Annex 1 countries. Total collapse of state sponsored industry after the fall of communism. This one is, however, contra indicated. This is not the tragedy of the commons, but of the Melancholy Dane, whose hubris was paralysis in the face of call to action. Land would be commons, businesses would be too, anything could be, everything might be, under some political or economic philosophies. Under capitalism (is it a capitalized ism? ), as little as is administratively possible ought be commons. If we can keep track of land, and we can keep track of carbon emissions, why is the one private property and the other commons subject to tragedy? You’ve dealt with externalities at the planning level, and must know what a disaster is wrought in such committees when the best minds and best will is brought to the issue. Why not let the democracy of the open market, once set up on a level playing field by well-considered principle, do the job of such committees instead? Certainly, the Australian scheme sounds lame. You’re a loud and opinionated fellow. Be loud at home about your opinion and get some brains into the process. I’d prefer it be brains informed by Adler, McKitrick and Pigou, but I’ll take smart and soused over ill-informed and irrational, any day. You know, unless I have the democracy of the open market to hear out the ill-informed and irrational, as is their right. By the way, how much has Lomborg recanted? The references I’ve seen are vague on his flip flops. A universal Pigovian tax seems a mite too much like an Animal Farm to me. Animal Farm is of course an extended Orwellian metaphor involving all manner of animals – and I have begged you to stop with the animal metaphors. What is the scope of your complaint – that I am a loud and opinionated fellow? Now that is the pot calling the kettle black – I must say. That from a prodigious philosophical gymnast leaping from point to unintelligible and disconnected point like some demented flea. The tragedy of the commons on the other hand is an environmental fable (involving a cattle metaphor) first sketched by William Forster Lloyd in 1883. In atmospheric terms ‘property rights’ is a tax on emissions. I don’t have a serious objection – practically the prolonged uncertainty is costing even more. In Australia – a $10 tax would be $5.5 billion a year. Enough for some serious partying – er – work. The alternative is a target of 5% reduction of carbon equivalent on 2000 levels by 2020. This will require some creative accounting. We are going to burn the trees we didn’t cut down in Phase 1 and return some of the carbon to the soil. This might be seen as an egregious scam by some pinko/greeny (watermelon in the Australian colloquialism) neo-socialists. So we have our very best men – Bruce, Bruce and Bruce from the Philosophy Department of the University of Wolloomooloo – at the UN right now making sure it is included in the very small print at the back of a 1000 page stationary order. Either way – I am damned if I give a proverbial rat’s arse. Having belatedly read Adler’s essay – I find the idea of a moral but not practical equivalent to the English common law principle on water damage nonsensical. It doesn’t exist as a real law – but then you immediately dementedly leap to Adler as a justification of a Pigovian tax. It is absurd because what is needed is real and practical development and not an idiotic and ineffective pie in the sky tax. Adler forgets one thing too much. The fundamental economic right of people is to economic growth along the most cost-effective pathway. They have an equal right to the resource of the air, it is available for the taking and there is not an alternative that doesn’t result in more and greater humanitarian disasters. Will there be Pigovian externalities if they increase carbon emissions? Perhaps so – but this simply emphasises the need to innovate technologically and renew global capital. You may disagree if you wish – but I will advise you to take a long walk on a short pier. No compromise is possible on this. And if you are going to simply insult me about it – then you can take simply take you’re nonsense and put it where the Sun don’t shine because I am out of patience with fools. BTW – I heard the dolorous Dane (the economics one) on the wireless last week. There didn’t seem to be much recanting going on but I am sure that once the inquisition – er – revolution gets going he’ll soon be recanting from every orifice. Oh Bart – my Bart – I take it all back. Can we be friends again? From me, how could loud or opinionated be construed as anything but praise? There’s no need to take anything back. We’re people of goodwill engaged in discussion of literature, the most serious and important subject of all, using as vehicles the cosmetically shallow and trivial mirrors of climatology and economics. And, as all the great economists of previous eras reportedly drank heavily, one cannot take as anything but encouraging that you imbibe while economising. You’ve come a little askew, however, on one key point. You argue that using the air for free makes the economic growth most cost-effective. Using the air for free makes the non-economic growth most administratively simple. There’s good argument for ordinary drawing of breath and commonplace use of air for natural processes at natural levels. Exceeding the common ceiling for use of air however is both administratively simple to price on the open and fair market and thus also immediately grows the entire economy, driving economization of this scarce resource through the innovation inspired by thrift. You will not most efficiently grow your economy by giving bits of it away for free to selective special-interest free riders. Thinking that you can is the hallmark of central planning, and is the inevitable path to corruption. You know this to be mathematically inescapable, Chief. Why continue to resist it? I feel a positively Rebelasian inspiration coming on – but just before riotously casting off all impediments preparatory to making the two backed beast on top of the bar – I wan’t to address 1 point. The true concern of economics is in the making of widgits. The true wealth of nations comes from the lowest cost production of widgits – it cannot be otherwise. One cannot artificially increase the production cost of widgits without diminishing the entire economy – the developing world doesn’t need that. We must remember in economics as in literature – that no widgit is an island entire of itself. Economics is concerned with reducing misery (much as G&T does not) through utility and increasing satisfaction with the allocation of scarce resources. Widgets are not really terribly central, except to central planners who either forgot or never knew what their job was. Capitalism is the democratic mechanism for efficiently assigning scarce resources by fair market means to all parts of the economy. If you as a central planner create a level playing field, build administrative tools to include all scarce resources in the market fairly, and minimize impact of externalities through careful and minimal regulation, and do so with minimal hierarchy and minimal bureaucratic interference while still maintaining your capitalist system, your part is done. The rest is up to the people to make their buying and selling decisions in that fair market with minimal regulation and minimal bureacracy. You don’t need subsidies by government, inducements by outside agency, extensive regulatory controls, or committees of civil engineers to decide for people. Put a price on it, and let people’s choices solve their problems. I disagree – both as to the wisdom of decorum and as to the centrality of widgets. A widget is a good that is desirable and that in every instance maximises utility. It is very simply an abstract unit of production. A widget is the essence and measure of utility. Let’s assume that a particular widget is price inelastic. It is food, it is shelter, gasoline for my indispensable Mustang or electricity for cooling prescription drugs, cosmopolitans or ice cream. Unless there is a specific alternative at a price differential that is less than the cost of the lowest priced commodity plus the Pigovian tax – then there is no shift to a different widget. The higher price (economic cost + tax) is simply forked over to Government by a long suffering consumer. This is the peoples choice you offer – and not one that I have much time for. People would have greater utility if they simply could buy more widgets at a lower cost (sans the tax – and I had best slow down on the French or I might find myself offending against decorum once more). Indeed many people could be forced out of the market entirely – hungry, exposed to the elements, dying from curable diseases, without either ice cream or cosmopolitans, riding a bicycle and being forced by the World Government to listen to Al Gore for an hour every day. There is no effect on carbon in the atmosphere. Is this the kind of world you want? Then there is the problem of the widget marketplace. There is and there is not likely to be a universal Pigovian tax. There are 191 countries happy to sign off on the Kyoto Protocol – as long as there are only 22 who must do something. Each of the others is committed to maximising their competitive advantage by using the lowest cost widgets as inputs to the productive process and to exporting lowest cost widgets to world markets. Thus do they maximise gross domestic product and progress along the path to development – and with an added competitive advantage. Hooray I say. But then the taxing nations increase tariffs on imported goods that aren’t taxed in the originating countries – a slippery slope to ruin all round. Why not simply set targets in a democratic plebiscite – 5%, 10%, 15%, 20% reduction by 2020 – and let loose the dogs of capitalism directly. Each firm responsible for sourcing offsets and reductions locally or globally – it matters little. If you sell a litre (damn those French) of fuel, if you supply electricity – it is a simple calculation. You call yourself a libertarian capitalist? I say this more in sadness than in anger – my Bart – but you are a disgrace to the ranks. Disagree all you like, I have neither impact on moderation nor am I moderate in disposition, as you can see. If you mean to refer to the abstract model ‘widget’ of classical capitalist economics, say so. Or even use the Seussian ‘thneed’. With your accent you need take special care to enunciate. This widget still is an expression merely of the application of first principles, not itself a first principle. While I accept your right to give an irrelevant premise of a good there is no substitute for, I must reject its applicability to energy from fossils. It’s well known and patent that there are significant alternatives, many of them price advantageous but with barriers to entry to the market due to the subsidized price of fossil energy dumped into the market. – Life choices like living closer to where one spends one’s time. – Low power substitutes for higher-power appliances. – Reduction in commercial and domestic waste. All of this before considering the actual alternatives within the category of fossil sources, which again are underdeveloped because there is no incentive due to the high barrier to entry caused by subsidized fossil. You are smart, Chief, and also can be wise, but you are not smart enough or wise enough to be nanny to every individual buyer and seller in the world. That’s what capitalism is for. Further, in my model — which you are letting your Australian statesmen steal half of; l’homme est libre au moment qu’il veut l’être — all the income goes per capita to the owners of the air, each Australian. Each Australian seller must therefore calculate their price levels based on their actual costs, and each Australian buyer may distribute their income to their shopping basket as they choose. You keep forgetting that Austrialians don’t lose a penny of their own money: Australian FREE RIDERS simply stop their theft of this scarce shared common resource from those honest souls who practice thrift, thus les mortels sont égaux; ce n’est pas la naissance, c’est la seule vertu qui fait la différence.. Pull up your garters, Chief. Go into the political arena and tell it like it is, once I explain it to you. Get your countrymen the other half of their money back. Because if you worry about Australia, Chief, I promise you the shining example of an efficient economy will create the demand for the same in your hemisphere, as individuals realize the very air theiy breath is being stolen from them and they come to demand pay in their pockets like Australians get, too. Sure, in the short run this will likely have some redistributive impact — boo hoo. In the long run, the distribution will level out, and once the current habits of imbalance are extinguished in the world populace, they will be difficult to fire up again as the tastes of a past and inglorious age, well left behind. In those far future days, then the carbon taxes can be done away with as people will find they have no value worth mentioning from them anyway due the disuse of fossils, much as when Australia did away with monarchy. Mon Dieu, rendez nos ennemis bien ridicules! And although I must admit to a weakness for Voltaire in my youth – it is a long time ago and a man such as Le Pétomane may have more of the skills needed for the modern age. If only we could harness it. Lurking on the CCS thread impressed on me again the pointlessness of it all. All alternatives we have not adopted as yet are horribly expensive. I can assure you that we do not subsidise oil or anything else very much – green nonsense being a horrible exception that has literally ended in death and destruction. Indeed – fuel is taxed heavily and has been for decades. To encourage conservation – I seem to remember – and entirely without success. I can assure you further that Australia has not dispensed with the Monarchy. Prince William has recently visited, the morning newscasts and gender specific magazines are full next months Royal Wedding and the Queen Herself shall Grace us with Her Presence in the near future. I’m not overly concerned with disappointing a politburo standing committee member on the topic of capitalism. You promise a widget in every pot by deciding for us all through your corporate charity system who has the means and who has the needs, and assigning the factors of production through energy communism. Thus are the roads of Australia financed not by those who most directly benefit from them — the oil companies and foreign vehicle manufacturers — but by Australian taxpayers. Not that Australians are overly famous for restricting their driving to pavement. Or straight lines. While I get that depression follows binging, once you dry out I’m sure you’ll find some point in something to cling to and raise your voice in the Australian democratic process such as it is. Twist in the wind all you like as a modern day Le Pétomane. This only goes to the error of Descartes – for it is all very Rebelaisian instead. Piss and wind signifying only mischievous playfulness and that greater, wiser and more enduring sense – that of humour. True and rare good sense indeed – but overwhelmed in most instances by a most un-Rebelaisian need to have a sober gravitas and, at the same time, show an amusingly discordant impulse to be as busy as a one legged man in an arse kicking contest. A Diogenic rumbling of tubs up avenue and down esplanade – doing his bit to add to the general air of martial briskness as the citizens of Athens prepared feverishly for war. As for Australian roads – I feel that I may have paid for a good distance personally through speeding fines. So much so that my licence is in dire peril and my wife is constantly on my case. Australia is sadly a matriarchal and a police state – in that order – pure and simple. Murder, property crime, smoking, drinking and pooning (the second definition – http://www.urbandictionary.com/define.php?term=pooning ) all halved in the past 2 decades. Whilst drinking and fighting are still common in our young men – I fear that is the price of sporting, policing, artistic and military prowess – drink driving has been almost entirely eliminated. Reggo (sic) is neither here nor there and what else is government revenue for if not to pay for essential services on which to fang it (definition 3 – http://madeinoz.com/lingo.html ) in my Mustang? As of this morning I calculated that I was paying US$5.50/gallon for ‘gasoline’. This is of course closer than not to double the US price. I was interested the other day to read this from the LANL – http://www.lanl.gov/news/newsbulletin/pdf/Green_Freedom_Overview.pdf – It is notable that stripping carbon from the atmosphere and converting it to synfuel is viable at US$4.60/gallon. It becomes a whole lot more viable with Gen IV nuclear reactors. At the end of the day – the one real solution is technological. Indeed, as the nation with almost all of the world’s nuclear fuels resource, it makes sense for Australia to process, reprocess and stockpile nuclear fuels. We have a stable geology, politics and (unlike others – you know who youse are) economy. We have the lowest level of government debt in the OECD, a living standard amongst the highest in the world, 4 of the world’s top 10 ‘most liveable cities’ and the Queen. In the interim, there are other very sensible and effective things we could do. Most obviously in reversing 200 years of soil carbon loss and land degradation – this has multiple benefits including much needed biodiversity and soil conservation. These are things that should be paid for by reducing the size of government otherwise. You are the proverbial one legged man my friend – having one leg in a ‘free market’ Pigovian tax fantasy but not another to stand on solid earth with. If you could give me but one instance where a Pigovian tax was fair, efficient and effective – the measures of a least market distorting tax. If you could show to me that paying twice or more for inputs does not lead to higher food costs for the poor and millions more starving. If you could show me that the disease is worse than the cure. If you could convince me that the developing world could and should instigate a market distorting and growth destroying tax. If you could show me that there isn’t a more direct and better alternative. In a quite reasonable invitation to join the Pigou club (http://www.economics.harvard.edu/files/faculty/40_Smart%20Taxes.pdf ) – it is stated that some 54 to 65% of economists favour higher energy taxes in the US. It is in my opinion a soft majority and an argument that fails to clear the hurdle of demand inelasticity. Demand for oil is inelastic – in practice demand is non-responsive to price by and large and especially so if other taxes are reduced at the same time. The argument is that if a high enough price is put on fuels then an alternative supply will emerge. That price is very high at this stage as we lack alternatives that are anywhere near price competitive – although there are dozens of technologies in the development stage. The one mature alternative – ethanol – has very serious dangers and limited potential to substitute for oil. At that high price demand for oil plummets as substitution takes place and then the oil price slides dramatically. As the oil price plummets the alternative suppliers call for more taxes to maintain their margins. Many oil producers go out of business – there is again a shortage of oil. The world economy wildly fluctuates between oil glut and bust and then Iran drops a nuclear bomb on Israel – the law of unintended consequences. The global economy is well known to be an example of a dynamically complex system – minimal interference by neo-socialists (such as yourself) and transparent good governance are the ideals to be defended at every turn. Even if markets stabilise with an alternative supply at much higher prices – there will be no tax collection and no compensation. The higher cost of inputs must result in less production and a market contraction that much of the world can ill afford. In the unlikely event of a widespread adoption of Pigovian taxes – at best there is a severe contraction in economic growth and at worst there is an economic disaster to make the GFC pale in comparison. I beg you – my one legged Pigovian friend – for the sake of the world and the poor to reconsider. It’s probably best to leave aside discussion of your marital and police issues, as the Internet is not famous for making marriages or the police happier. Buy her some flowers, apologize, and take her to a nice show. Let her drive. Unless your middle name is Sally, a mustang’s really a lady car these days anyway. Ditch it (the mustang) for something that won’t make you to spill your gin on a sharp corner. It’s good that you’re getting your Australian patriotism and monarchism out of your system. You are coming across as needing a good flush-out of those coprolites. But as much as I enjoy a good round of French musical flatulism, you’re merely petomanically adding biomethane to the atmosphere now with your amateur views on economics. Let an Englishman offer an anodyne, “Ye fearful saints, fresh courage take; the clouds ye so much dread. Are big with mercy and shall break in blessings on your head…” Eurgh. A bit preachy and slow, that. Hardly Kylie Minogue. No, no. England is the wrong direction. Perhaps we ought seek insight from a more civilized neighbor of France? “Nie chcem, ale muszem.” Were it not for the artificial sweet tooth of free riding fossil consumers brought about by generations of mismanagement and bungling by committees who thought they could usurp the decision power of the open market and replace the democracy of capitalism with central planning, we wouldn’t need to correct the extreme market imbalances in favor of fossil like this. Sure, your generation and its methods have brought us to this, but it’s not too late for you to see the error of your ways and abandon corporate communism for clean, clear free enterprise without the subsidy of oil industry charities. All your pessimism about Australia being able to turn around from this business socialism is unwarranted. It’s been done before, by countries in more dire straits (and let’s face it, when better to change direction than when on the crest of the wave?) and from more dire burdens. No – the show need not go on as it is. I had not wanted to point a finger at the appalling state – by contrast to the Australian – of most of the economies of the world. Neither to slate home blame for the locus of the origins of the latest economic contagion. Merely to suggest that it is ill conceived for the pot to call the shining light on the hill black. The rationale for a Pigovian tax is to recompense those who are inconvenienced or worse by some aspect of production – noise, smells, etc. In this case the money should accrue to the injured and be an impost on the production of those goods. If the cost is included in the price of products beforehand, it will reduce the supply to a socially desirable amount. Thus, the Pigovian tax can, in theory, achieve Pareto optimum, the most efficient allocation of resources whose utility cannot increase without decreasing anyone’s utility. In the case of a carbon tax, it is something more. It is – designed is far too grand a word – piously hoped that a carbon tax will increase the cost of production to one that facilitates substitution of low carbon energy. There are logically 3 outcomes. It fails to achieve substitution – in which case we simply have what is known as tax churn – taxes are charged and returned as tax cuts elsewhere and as increases in social welfare – a complex, expensive and ultimately pointless exercise practiced piously but with any effect all over the world. One other possibility is that substitution succeeds. In this case we have production costs that are permanently high and no recompense for the poor. An infinitely worse outcome for the 146 million people in the world who are at the limits of survival. The third potential is for unforeseen outcomes and economic calamity – something that is not to anyone’s taste. You forget also that Australians own communally most of the companies on the ASX through our pension funds. What you ask is impossible. It is a recipe for capital destruction on a vast scale. I would rather take up pooning and risk arrest, public shaming and divorce. We will not have a carbon tax despite the posturing of our temporary Prime Minister. Romantic ideals about ownership of the air or evil oil companies does not put food on the table – and now I am a little bored with children’s fairy tales. This quote from Friedrich August Hayek appeared in my inbox this morning. Now if you stop crying – I will buy you an ice cream. Watching you practice your artful Australian origami with economics has been entertaining, but reminded me that you’ve been short on substance. 1. A tax on something that doesn’t exist is irrational. 2. At present, outside of those two dozen or so places that have a charge on GHG budget of any sort, the charge itself doesn’t exist in the market. 3. While I admit a Pigouvian tax on this charge may be valid and necessary, the charge itself — separately and distinctly — is what matters first. So, to cleave your Australian origami like Alexander did the Gordian Knot, let us cut out talk of tax on GHG emission until we establish a price on GHG emission. We’re not being Pigouvian, or taxing, or speaking of anything except Capitalism, so long as we speak strictly of putting a price on GHG emission. Australia may even have it right, that the tax on this charge ought be 100% — that is, half the amount collected goes to the people per capita after some manner, and the other half as a highly punitive level of Pigouvian tax goes to remediation schemes and studies. I can’t say, I’m not Australian, I don’t know how criminally dependent Australia’s corporate charity schemes have made the average Aussie about GHG. One tends to get sloppy and wasteful if all one knows is dole-outs and sloth. Preaching to the choir a bit there, Chief. Also, you very much misapprehend me if you think I’m representing in this a weaker or more incorrect economy than your own. In true mercenary style, I’m carrying the device of British Columbia, whose revenue-neutral carbon-taxing economy pound for pound leaves yours in the red dust of the Outback. You certainly can’t be claiming I’m arguing for the policy of the USA. “In the case of a carbon tax, it is something more. It is – designed is far too grand a word – piously hoped that a carbon tax will increase the cost of production to one that facilitates substitution of low carbon energy. See, when you leave out “revenue-neutral” you start talking about something different from my proposal. Your straw man is easy to defeat. How unlike you — normally, you like the challenge of taking on the real thing, not an imposter. Take on the topic of revenue neutral carbon taxes with per capita disbursements. Understand the shopping-basket dynamic of putting fair market democracy back into the hands of consumers while destroying the faith of business charities in corporate communist handouts. You forget also that Australians own communally most of the companies on the ASX through our pension funds. Oh, Chief. You think Australia invented pension funds? How cute. This quote from Friedrich August Hayek appeared in my inbox this morning. Well, if I can’t be endorsed by you Chief, being endorsed by Hayek is something I can settle for. D00d, I’m really not going to accept ice cream from strange men I meet on the Internet. trend is not entirely consistent with the carbon dioxide change. Most of the temperature increase occurred before 1940, after which Earth started to cool until the early seventies, when warming resumed. Carbon dioxide, on the other hand, has been increasing steadily throughout the past century. You need to factor in Mt Pinatubo cooling in the early 1990’s. It would otherwise show a warming trend from the 80’s to the end of the 90’s. But as most of this was caused by cloud change – http://isccp.giss.nasa.gov/zFD/an2020_SWup_toa.gif ? Note the big cooling spike from Mt Pinatubo. I’m not getting a “Reply” option on your 28 March 12.05 post quoting Descartes, perhaps because the thread is off-topic, so will post here. Still off-topic, the foundation of Descartes’ philosophy was off-base. Observing the process of thinking, he determined “I think, therefore I am,” rather than “Thinking is” – the process throws no light on the existence or non-existence of an “I”, and if you go beyond cerebration to direct observation of the sensations constantly arising on the body, you’ll find that – like all matter – you consist of particles of energy which arise and pass away with great rapidity, a flow with no continuing solidity or entity. You have to go to the top of a very long dialogue with Bart – but it was Bart who first selectively quoted Descartes and I have advised him to take up pooning rather than philosophising. But I suspect even the mathematically astute Descartes was in this instance being ontologically disengenuous. How could all men be created equal in good sense. Witness the aforementioned long and fruitless dialogue. I am more Manichean than Darwinian by persuasion (more Star Wars than Planet of the Apes) and this arises from consideration of the special theory of relativity. The 3 dimensional axes of Descartes are transformed into an inertial frame in 4 dimensions in which everything exists unchanged in the space/time continuum. I admit the horror of that thought drove me to conceive of the perfectability of the space/time continuum. All the moments of murder, war and torture of human history preserved eternally constant and unchanged – like insects in amber. Better to think that the light of goodness ripples outward in space and time redeeming the universe. I agree, however, that the problem of consciousness by far transcends the limits of logic. The answer to life, death, the universe and everything – is laughter and poetry. Better to think that the light of goodness ripples outward in space and time redeeming the universe. The answer to life, death, the universe and everything – is laughter and poetry. This is why I can never be a CAGW Believer – I’m an advocate of goodness – and I’m unwilling to allow either my sense of humor or my appreciation of beauty to be amputated. Perusal of the citations of the Hall et al. paper on Google Scholar shows only 6 citations; hopefully this post will bring further attention to this important paper. I checked on it via Web of Science and there it only showed 3 citations! Why so few citations for a paper from 2005? For reference, McIntyre/McKitrick is listed as 30 citations on Web of Science, and it came out around the same time. Good point, Scott. Unfortunately, rational analysis of complex issues has not been a major research area in general. This is especially true in regard to the climate change issue, which has been dominated by political activism. On the other hand, seminal papers often lie dormant until their problem arises. Dr. Curry has worked to make the logic of uncertainty a significant issue. Hopefully we will now see more research along these lines, although I know of none so far. Instead we are seeing psychologists and social scientists trying to explain uncertainty as a communication problem, or as deviant behavior. I have been a walking weather station and observer for 67 years and I see no evidence for “climate change”. That is to say, the pattern of weather in the various regions of the earth is about the same. Weather can be quite variable on yearly basis, and there can be extreme weather event suchas the Dust Bowl of the 1930’s. Over the long haul, however, weather usually and eventually settles down to its normal pattern. There are many regions suchas Death Valley and Antartica where climate hasn’t changed for over a century and will never ever change. Too much to time, money and human effort is being wasted on speculation about future “climate change”. Speculation should be reserved for casual conversation in the pub or at the bar after the day’s conference presentations. To those who support IPCC’s “accelerating warming” (http://bit.ly/b9eKXz) looking at the following chart (http://bit.ly/fgy33O) makes you question the validity of IPCC’s claim. Unfortunately, at this point in time some have hijacked science (truth) to claim black is white & white is black. My science & mathematics professors would role in their graves if they see what is happening. I have also become deeply cynical of any one who uses science to claim anything.